Getting a professional facial is a delicacy. There’s nothing like being pampered in a cozy treatment room bed—the steam, the thorough pore cleaning, and we can’t forget the facial massage! Experts recommend you get a facial every 4-6 weeks, but that can be hard to work into your budget. As an esthetician I gave facials to clients for years and absolutely loved it. I even gave myself facials in my treatment room in between clients. empowering you to do it yourself! Now, I spend time educating people on how they can give themselves facials. It’s an absolute dream job because I can share my knowledge of natural skin care in a really empowering way. Facials are an essential key to healthy, glowing skin. By regularly performing at-home facials you can even out the look of your skin tone, enjoy deep cleansing benefits, and experience overall rejuvenation. Giving yourself a facial is a gorgeous form of self-love (and a great way to get to know your skin). Below is a step-by-step guide to how to do an at-home facial treatment. It's simple, effective, and super pampering. So grab your favorite robe, sit back, relax and feel beautiful! The first step of your facial is the most important. Cleansing removes dirt, oil and makeup to give your skin a “clean slate.” This allows all other products to penetrate optimally into the deeper layers of the skin. 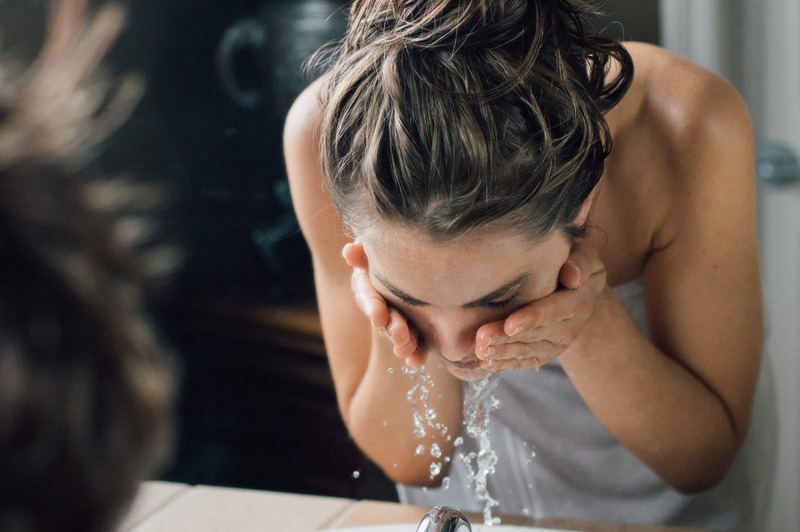 Technique: The way you wash your face matters. It’s common that after a long day you want to jet through the cleansing process and go to bed as soon as possible. I’m here to tell you that this step (especially during a facial treatment) should be emphasized and performed for at least a few minutes. Now that your face is squeaky clean, it’s time to exfoliate. Exfoliating is imperative for creating a healthier, smoother appearance. This not only helps with evening out the look of your skin tone, but also with refining the look of your pores, smoothing out the appearance of fine lines and wrinkles and improving your skin's feel. Exfoliating also greatly increases product penetration. Technique: Apply a dime-sized amount of scrub, such as our Kaolin Micro Exfoliant, to the skin and then use upward, circular motions with light pressure for 1-2 minutes. If you prefer, you can use a chemical or enzymatic exfoliation like a fruit acid peel. You can read more about methods of exfoliation here. When steam enters the facial, this is when the home spa vibe really gets going. To me, steam is the most relaxing and cleansing part of a facial. It opens the skin follicles (pores). How to steam: The easiest way to steam is to bring water to a boil in a large pot. Take a towel and drape it over your head and slowly lean your face over the pot so that your face is directly over the steam. (Be careful to not get too close!) It should feel warm, not hot. Get creative with your steam—add rose petals, rosemary, thyme, or any other herbs. A few drops of essential oils are lovely, too! Steam for 10-15 minutes, with intermittent breaks if you need. If you have sensitive skin or rosacea, steaming may not be ideal for your skin type. I know it’s tempting to want to extract your blackheads, but as a licensed professional I recommend only getting extracted by one. I say this because extracting incorrectly can result in tearing and/or scarring the skin. Note: Extractions should only be performed on blackheads, which are typically found in the T-zone area (forehead, nose, chin). Blackheads are oxidized sebum (oil) that show up as black “dots.” Blackheads are open comedones. Pimples, also known as whiteheads, are closed comedones, which you should never attempt to extract/squeeze as this could exacerbate inflammation, cause breakage in the skin, and result in scarring. How a professional extracts blackheads: Extractions should only take place after steaming the skin because steam helps to open the follicles and soften the oxidized oil in them. To extract, they wrap a tissue around each index finger and carefully place one finger on each side of the blackhead pushing down gently with a slight “squeeze.” The blackheads should come out easily. If they do not, leave them alone to avoid further irritating the skin. They may also use blackhead removal tools. After all of those deep cleaning steps it’s time for some pampering. Now you can relax and give your skin some tender loving care! The treatment mask is the heart of any facial. This is when your skin is most ready to receive yummy nutrients since it’s just been cleansed, exfoliated and steamed. Choose a mask most suitable for your skin type. Our Coconut Honey Mask is excellent for dry, mature and normal/sensitive skin types, while our Purifying Mud Mask is ideal for oily and normal/combination skin. Apply your mask and leave it on for 15-20 minutes. (Now would be the time to place cucumber slices on the eyes if you really want to get into it!) Remove with a warm washcloth and splash skin with cold water. Continue by applying the same steps you’d complete in your daily facial routine. Plug in your favorite toner such as our Neroli Toning Mist. Mist and let skin dry before applying your favorite serum. I love the cooling feeling and deeply hydrating effects of our Anti-Aging Serum. When working in a spa before I was working for Annmarie Skin Care, I used to always use this serum on my clients after a facial as it helped to calm and soothe the appearance of the skin. Let’s put some pep in this final step and seal in that bona fide beauty. Moisturizing is an essential step for the face and around the eyes, so pick your favorite oil or cream and massage deeply into the skin for 1-2 minutes. Facial massage is a great way to tone and lift the appearance of the skin, relieve tension, and drive the oils in deeper, giving your skin layers and layers of love. Finish with a spritz of toning mist, as this will also push the facial oils into the skin more effectively. And there you are! You’ve just given your skin a beautiful at-home facial. How do you pamper yourself? What other tips can you share with us for an at-home spa treatment? Thank You for this! I don’t think I’ve ever done the whole shebang…. esp with Annmarie products! (Maybe a nap on the hammock, under the oak tree, afterwards would be in order too.) I also see where it does not say to “rinse” the face after the facial scrub… but obvious. Going to treat my self to this on my day off tomorrow! Using more and more of AM products(as much as my budget will allow) , and I am so impressed with results. Can’t see going back to toxic comercial products! Raspberries are an excellent source to calm the skin, you can mash them put them through a mesh strainer prepping only the extracted juice and add it to an avocado mask to sooth sensitive irritated skin. Bonus: it smalls AMAZING! I use brown sugar with cold pressed evoo and sometimes honey for my face scrub. I have to wash it off with gentle cleanser after but it leaves my face really soft. I pamper myself with candlelight / music / aromatherapy baths. (Of course one could be doing a facial at the same time). My fav is vetiver / patchouli / Moroccan rose essential oils in the bath and Lorena McKennitt for the music. Take me away! Thanks for the music recommendation! Looked her up and may have found a new go-to to listen to! Perfect for bath-time! ??? Hi, at what point do you remove the scrub… Before or after the steam? Thanks! Wow im answering to your question after 2 years…? I decided a short time ago to go organic for my face and body. I was an avid Mary Kay product user. I purchased your sample kit a couple of months ago and I’m hooked!!! I purchased two of your $20.00 sample kits just recently, one for myself to take on vacation and one to my oldest daughter who has trouble keeping her face moisturized. She lives in the high desert of Colorado. She is hooked also!! I know what I’m getting her for her birthday! Thanks so much for your excellent product! Is there any reason I can’t use my index finger along with my middle and ring fingers to clean and exfoliate? I get better coverage when I do so and it is easier to maneuver in upward circular motion? I just did this facial this morning and it felt amazing! My skin feels so soft and smooth. I was so excited to find out that I already have everything I need for an at-home facial. This is definitely going to be a new monthly routine! Thank you!!! I just need to make an appt. By the time I pay/gather everything I could just be relaxing in the process. I so need this. Wow Wow! I can’t wait to do it! it sounds heaven for the skin. Thank you for all these steps, this is something that I really need. Thanks for sharing this information with us and to give us tips on how to do it ourselves since these treatments are very expensive in a professional spa. I’m very satisfy client with your products and I’m being using them for over 6 months. Excellent Job!